Granada Food market is close to the Cathedral. As in many Spanish cities you find a central market in the city centre. In Spain there are many well known markets. 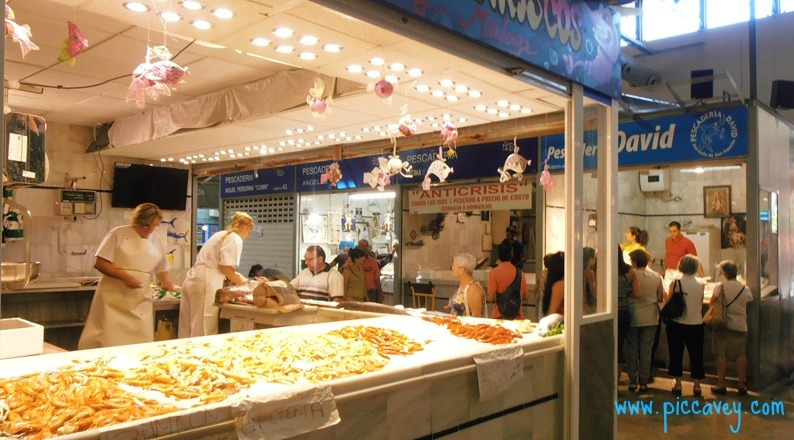 Examples such as Mercado de San Miguel in Madrid, Las Atarazanas in Malaga or the Boqueria in Barcelona. All are inside beautiful old buildings and worth tracking down on visits to these cities. In Granada the streets around the Cathedral and Alcaiceria were the home of the main city market. Granada´s market has been traditionally on the streets rather than inside a main building. Stalls around the Plaza Romanilla and Plaza de la Pescaderia would have been the market place for the citizens of Granada. The name of the Plaza de la Romanilla named after the type of weight which would have been used to weigh the goods. 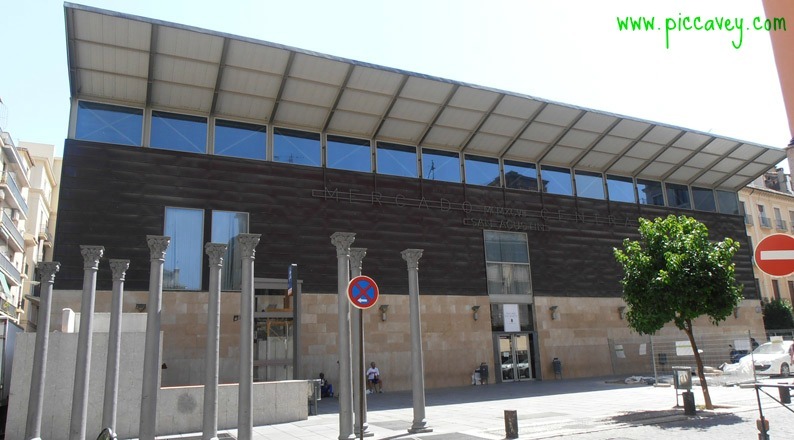 Nowadays the central market is el Mercado de San Agustin, Granada. (just up from Calle San Jeronimo or just down from Gran Vía). This site used to be a convent the Convento de San Agustín, up to the 19th century when it became a public space. And then in the 1970´s it became a Spanish Food market. So what can you buy inside this market? Lots of delicious Spanish food. There are butchers, fishmongers, fruit and vegetables and several specialist stalls. Homemade meals ready to go for those who don´t cook, olives of all sizes and colours. There are gourmet style stalls with Olive oil, wine and cheese too. Many of them even have samples on offer so that you can try before you buy. One of the stalls that caught my eye as I wandered inside was Puesto 28. 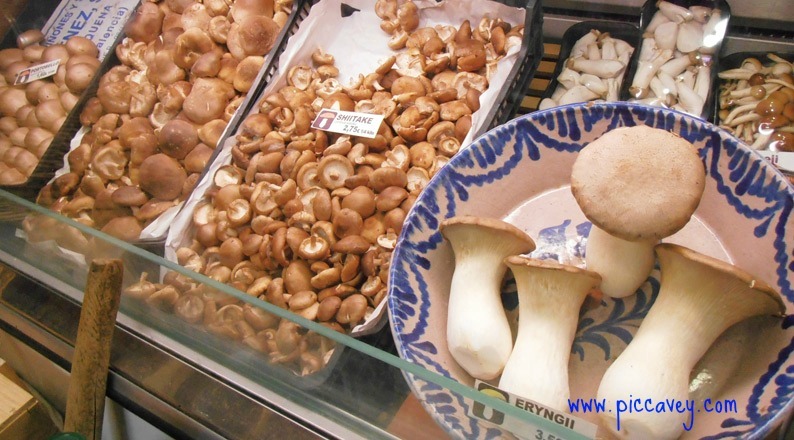 This had lots of mushrooms and other items of local Granada produce. The presentation was eyecatching, it had an earty forest feel to it. Lots of different varities of olives, mushrooms and oils too. The owner of the stall was very friendly and took time to explain the different products and their provenance. There was also some olives and olive oil to try on a stand at the edge of the stall. One of the olive varieties he had on sale was a sweeter tasting black variety. It´s one of his best selling products. Of course the fish stalls in any spanish market always get my attention. 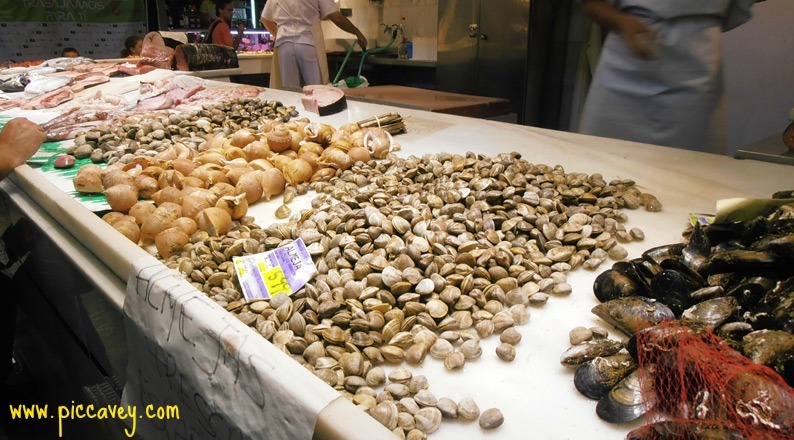 The fresh catch is brought to Granada from Motril, on the Costa Tropical. This coastline is just a 40 minute drive from the market, so transfer time from the Lonja to the market stall is short. Around the mercado de San Agustin there are lots of small shops and in the narrow streets below. Comestibles San Agustin is a traditional grocers store. They stock local products such as oranges from Lecrin valley and preserves such as Asparugus grown in Huetor Tajar. Next to the market entrance I noticed a herbolario or herbal shop . They have a good selection in their window. There is even a hardware store, Ferretería in Spanish, to pick up items for minor home repairs. If you have been to the market recently you will notice changes happening inside. The San Agustin market in early 2015 will have a new gourmet area. Located in the centre of the market to showcase local products. They will promote produce from Granada and also run food events such as tastings and demonstrations. Outside in the market square there will be an outdoor terrace area. This will be a good chance to sample produce from the market with a cold local beer. I really can´t wait to see this up and running. I bought some Wood Blewitts there a few years ago: fried with olive oil and garlic – absolutely delicious! Very nice post! Strangely enough I never made a connection between Spain & mushrooms. Now I know they are being produced and sold as well, and they are beautiful. The map is very helpful. I´m off to check out your blog now.. I can´t wait until the new gourmet area opens.